Bicycles have always been a major problem in our garage for many reasons, including the awkward size, number and the fact my son uses his regularly and needs quick, easy access. He also needs to be able to easily put it away and keep it upright, or else it won’t happen. Sound familiar? 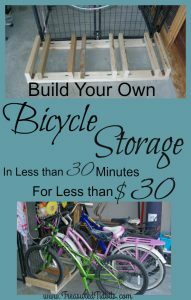 The original plan was to store the bikes on the other side of our dog cage (deeper into the garage), but as you can see, that plan went right out the window. The bikes are now kept right inside the main door for quick, easy return and removal. This is what the new rack looks like empty. Cut 2 2×4’s to desired length. We measured ours to match the width of the dog cage. Cut support boards 18 inches in length. 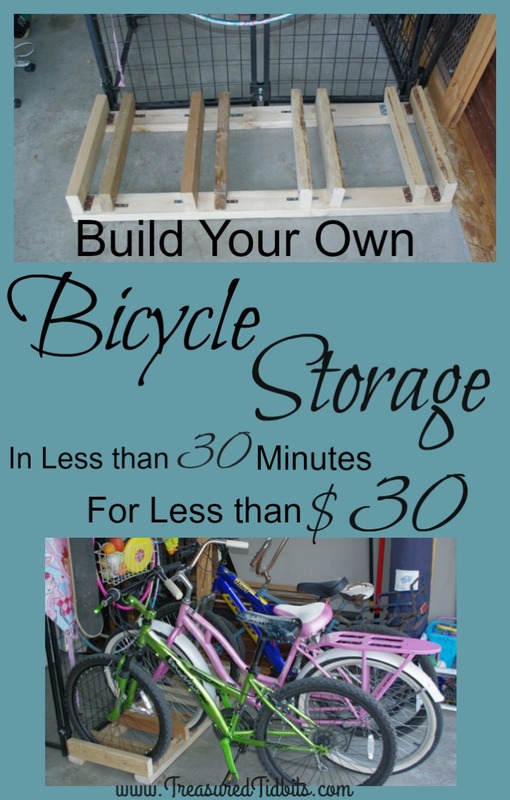 2 Per bike to be stored. This will support the front wheel on each side. Lineup 18′ boards and mount with corner braces. As you can see, ours is built at varying widths based on the width of handle bars on each bike. We recommend holding them in place and determining the location of the next support before securing. 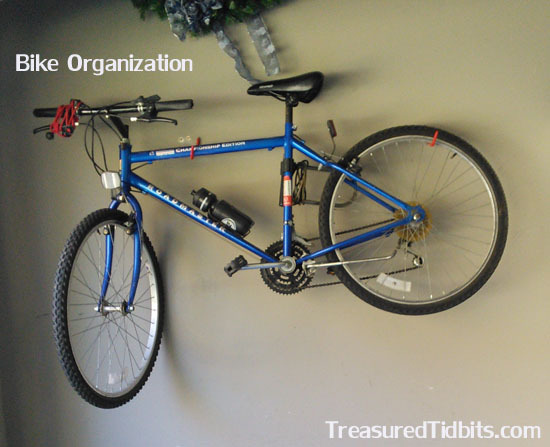 My husband’s bike has been mounted on the wall since we moved in using these wall hooks, because they are what we had on hand. He seldom uses it, and this keeps it out of our way during everyday activities. These hooks are made specifically for bicycle mounting and may be better for you if you use your bike regularly. For more great ideas follow us on Pinterest, Instagram, Facebook and sign up for weekly emails. This post contains affiliate links to learn more read our disclosure policy found here. Thanks! 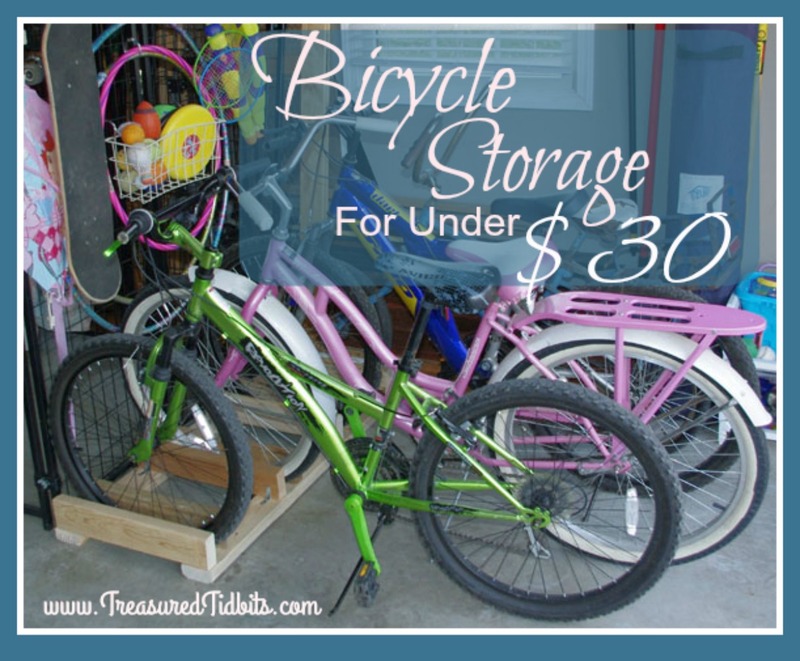 i have eight kids and trying to keep the bikes corralled and available for them is crazy. I’m planning to try this tomorrow!